Since the time I was a teenager in the 80's, I have been aquainted with Ten Thousand Waves. I actually lived right across the road from them in a large rented adobe with my uncle and his Rock-a Billy band. At that time, memberships for the public tub was only $30.00 a month! Although they have gotten a bit more expensive they have added private rooms, a larger selection of tubs and have had a full staff for massage now for a nunber of years along with overnight lodging. 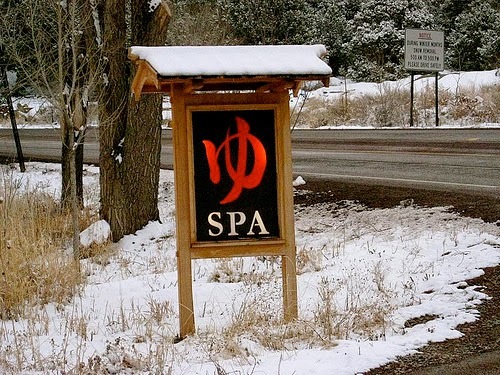 Set on the road to Hyde Park National Forest and Santa Fe Ski Basin and surrounded by pinon and juniper trees, this Japanese style spa is the mountain spa that dreams are made of. I always think of them at this time of year. My friends were all " ski bums " and the perfect winter day in Santa Fe would be a day on the slopes, followed by a soak at Ten Thousand Waves, and then on to one of the many downtown restaurnts for a green or red chile dinner. This month they celebrate their 34th Anniversay! Oh how I wish I could relive those days for just one night! Especially with Valentines Day around the corner-what a great romantic getaway this would be! Alas, I am far away in Seattle, Washington. But that doesn't mean you cant! If you live in New Mexico or are visiting, do not miss out on this wonderful healing and relaxing experience. 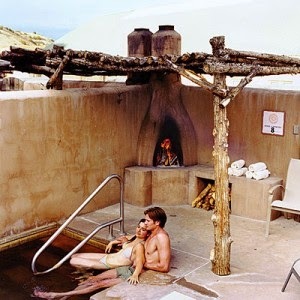 Nothing says romantic getaway in New Mexico like a day at Ten Thousand Waves. To book a tub, massage or romantic weekend, go to their website HERE. Even thought these hot tub are cheap they still using the same quality parts as the expensive manufactures put in there hot tubs. There are also plenty of investors who purchase a condo hotel unit with little intention of ever using it; they're in it for the potential appreciation of the real estate. Please enter your email address to subscribe to: Vacations That Rock! You won't lose this wallet! Get this locking backpack from Xana! Sancho's banana bag on Xanaland! Check out this totally tubular handbag! Yee-Haw! Get yer Western Camo Purse from Xana! The cat's not *in* the bag... The cat IS the bag! Be a conscientious type of goth..
"Piano" means "soft" in music. These piano socks are super soft! How fitting. Don't Go On Vacation Without This Handy Tool. Victorinox Swiss Army Explorer Pocket Knife (Black) - Click Here To Buy! Cool Umbrella for sale in case it rains this summer! Now You Can Carry The Kitchen Sink - Check Out The Link Below! Oakley Men's Kitchen Sink, Worn Olive, One Size - Click Here To Buy!